SkypeWeb is a plugin that allows using Skype in Pidgin / libpurple chat clients. The plugin can be used to send instant messages and participate in group chats, but it does not yet support voice / video calling. A new SkypeWeb Plugin version was released today, 1.5, which brings alternative auth support for those who can't login with the default login method. But before this, make sure you try to login in a web browser first. That's a common issue with Pidgin SkypeWeb plugin and simply loggin in to SkypeWeb in a web browser fixes it, so keep this in mind. See this page for how to work with Skype group chats in SkypeWeb plugin for Pidgin / libpurple. Make sure you download the correct file for your operating system and architecture. For Windows, you can simply download pidgin-skypeweb-installer.exe which sets everything up, but you may also download the libskypeweb.dll file, which you'll need to place in the APPDATA%\.purple\plugins\ folder, then restart Pidgin. This assumes you're running the commands in the folder where you've downloaded libskypeweb32.so or libskypeweb64.so. Once you're done, restart Pidgin (in case it was already running). 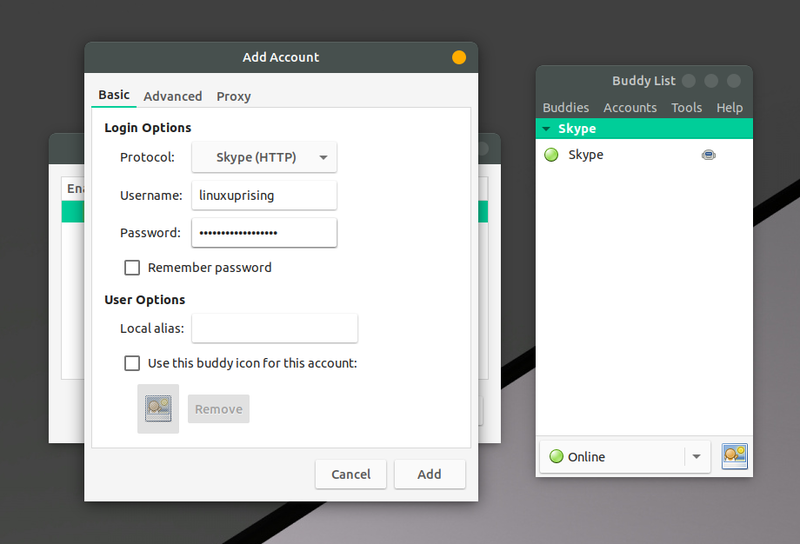 You can now add your Skype account in Pidgin. To do this go to Accounts > Manage Accounts, click Add, enter your Skype username and password and select Skype (HTTP) under Protocol - make sure you select this and not some other protocol name (don't confuse it with the old Skype Pidgin plugin).